Coming from Austin, Texas is a new one from the man who rules the blues world in that town. 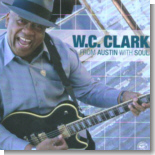 W.C. Clark's latest one for Alligator Records is this month's Pick Hit. We have two different reviews of the new one from blues harmonica legend James Cotton. 35th Anniversary Jam is our Surprise feature this month. Ten years ago The Holmes Brothers took part in a World Music festival, and the result was the wonderful gospel CD Jubilation. You can read all about it in the Flashback section this month. This month's What's New section features new releases from John Mooney, Tinsley Ellis, Long John Baldry, Big Nick & the Gila Monsters, George Bowman, Floyd Taylor (the late Johnny Taylor's son), Guy Davis, Bruce Conte, James Blood Ulmer, and more.